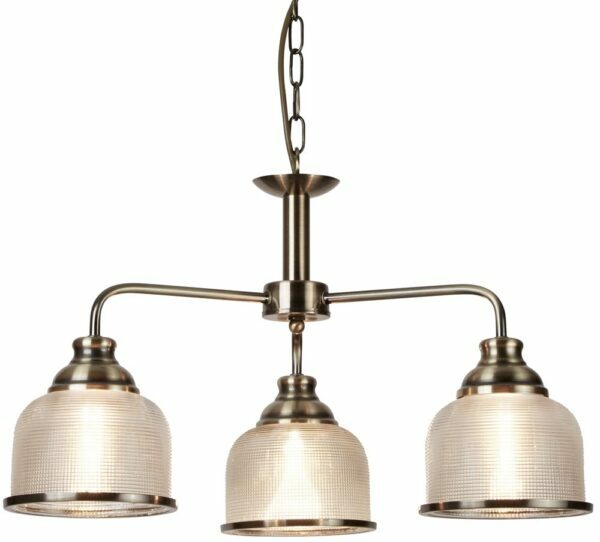 This Bistro II antique brass finish 3 light chandelier with retro style Holophane glass shades has vintage chic and modern practicality. Featuring a circular ceiling cup, chain suspension and central rod, with three curved arms, large spun shade fitters and downward facing Holophane glass shades finished with antique brass trim. There are matching fittings available in the Bistro II antique brass finish lighting range that includes a single pendant, two and three-light pendant bars, a five-light chandelier and single switched wall light; please see below. Also available finished in satin silver. This retro style light is supplied by Searchlight who manufacture some of the best traditional and modern classic designs such as the Bistro II antique brass finish 3 light chandelier with retro style Holophane glass shades you see here. Check out all our solutions for lighting up your kitchen in our parent category. You’ll find plenty to choose from including fluorescent, led and under cupboards lights that are both functional and stylish.